What is the worst podcast ever? Well, this is my worst episode ever. What is the worst podcast ever? Well, this is my worst episode ever. 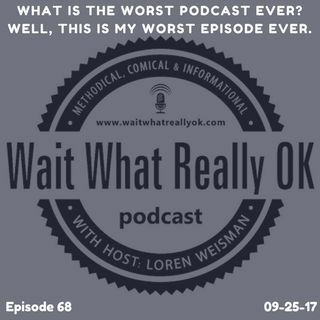 Wait What Really OK Podcast Episode 68 hosted by Brand Precision Marketing Strategist and Counselor, Loren Weisman delivers a gabbing dumpster fire of an episode. On little sleep and making little sense, Loren talks about how not all content has to be perfect and how well branded content, even if it is not the best, can still help to promote better content you have. It is not about perfect, and this episode is far ... Más informaciones from perfect, but it gets the point across about continuity and the editorial calendar. With this podcast in a template form, it was easy to slide in the audio and adjust the visual and written to get it up quick. What is the worst podcast ever? I’m not sure, and I hope it is not Wait What Really OK, but this is far and away the worst episode ever. Ep 68 “What is the worst podcast ever? Well, this is my worst episode ever.” of the Wait What Really OK Podcast is available on iHeartRadio. Podcast Blog Supplement for Episode 68 of the Wait What Really OK Podcast with Loren Weisman. Podcast Link Supplement for Episode 68 of the Wait What Really OK Podcast with Loren Weisman. Are you collecting or connecting with people on social media? Podcast Video Supplement for Episode 68 of the Wait What Really OK Podcast with Loren Weisman. Podcast Photo Supplement for Episode 68 of the Wait What Really OK Podcast with Loren Weisman.